The UK’s National Health Service recommends a max of 10% of calories from added sugar and fruit juice. A group of health researchers, though, has recently called on the NHS to halve that.Even in the US, the recent nutritional panel that recommended the USDA drop the warnings on dietary cholesterol also suggested they implement a recommended 10% maximum of daily calories from added sugar. As of now, the USDA hasn’t made any changes, choosing to lump added sugar in with “solid fats” (which is as weird a combination as I’ve ever seen) and suggesting we obtain no more than 5 to 15% of our daily calories from them. Quite how this is supposed to work is anyone's guess. Any sugar used to make baked goods, candy, chocolate, desserts. HFCS, molasses, agave nectar, white sugar, brown sugar, honey and any other isolated sugar. Any sugar found in sweetened beverages, including the naturally occurring sugar in fruit juices (most countries consider fruit juice sugar to belong to the added sugar category since it’s divorced from its fiber; I tend to agree). The trouble with this sort of recommendations however is the implied message that we should view sugar as a percentage linked to the overall amount of calories consumed. If you want more sugar simply eat more calories.Furthermore there is no consideration of the fact that most people over-eat and under move. Added sugar has a very different metabolic effects in a hyper-caloric sedentary person with overstocked glycogen than in an active person who regularly burns glycogen through careful diet, food timing and exercise. The other problem, as I see it here, is that adding sugar to food rather than appreciating the natural sweetness of whole foods (such as fruits, vegetables, almonds, sprouted wheat and rye, etc.) not only contributes to disrupted metabolism but also makes our taste buds and brain chemistry excessively dependent on sweetness for satisfaction and well-being instead of actual flavour. The dulling of our taste buds influences our food choices and can quickly run out of control. This is something that food manufacturers are well aware of and happy to exploit with deceptive labeling. 1) Serving size: frequently unrealistic this deceptive labeling helps to make it look as if something is very low in sugar/calories. 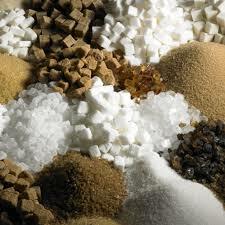 2) Separating sugar from total carbohydrates, implying that carbohydrates are not real sugar. Yet after digestion all carbohydrates end up as simple sugars (fructose, galactose and glucose). Fructose and galactose maybe slightly worse offenders for the liver than glucose but ultimately once they eventually find their way into our blood we either burn those sugars or or store them for later. 3) No added sugar doesn't mean it has no sugar. Fruit juices, smoothies and diabetic jams are the worse offender in that category of deceptive labeling. 5) lactose (or even gluten) free and low fat: may imply that they are healthier but are no reflection of the overall sugar content. In fact a low fat product very often contains more sugar (carbohydrates) than its full fat counterpart. You may think that carbs versus fat is the lesser of two evil but in fact the metabolic pathway of fat means that it does not contribute to hypoglycemia, diabetes or any of the chronic diseases associated with metabolic syndrome and disrupted metabolism. Ultimately the only thing to remember is that sugar and carbohydrates are naturally part of the wholesome foods we depend on for essential nutrients and energy. The simpler the diet and the closer to their natural states the ingredients the healthier we will feel. We do not need to add sugar when we can add sweetness, tastes and colour from fresh fruits nor do we have to eat a lot of processed bread and baked goods when we can snack on nuts, seeds and home baked sugar-free goodies. For more info on low carb, low sugar baking check my recipes.